Macrame wall hanging that adds a unique, boho-inspired touch to any space. Hang it on your wall as a decorative piece or in front of a window. Each piece from our limited collection is authentically vintage and one-of-a-kind, so the piece you receive may vary slightly from what's pictured. 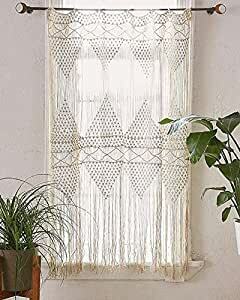 Turn any space into your own little folk paradise with this curtain for framing windows, closets, doors. This fringed statement piece is handwoven items. Each piece from our limited collection is authentically vintage and one-of-a-kind, so the piece you receive may vary slightly from what's pictured. We recommend washing by hand in cold water.